There’s something about herring that I’m drawn to, over and over again. 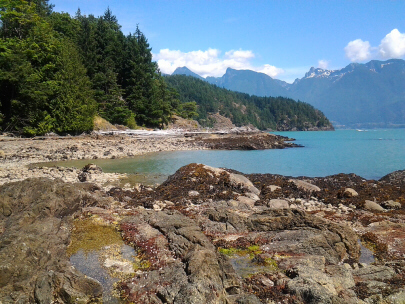 Maybe it’s the silver flash of their bodies in the water, maybe it’s the fact that they’re essential to our coastal BC ecosystems (food for pretty much everyone else) and yet in public consciousness largely overshadowed by the sexier wild salmon. 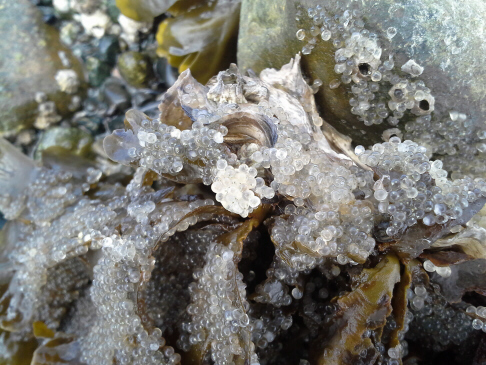 Regardless of what it is, for a few years now I’ve been longing to see herring in action. You know, the actual SPAWN. I came so close this year. 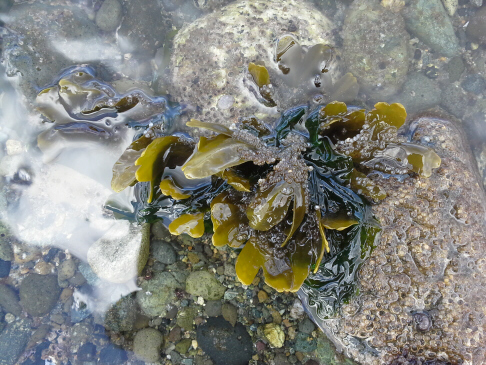 In mid-March, I dragged my family to Parksville (under the guise of a family reunion, but the real driver for me was getting to the Brant Wildlife Festival and seeing those herring do their thing). 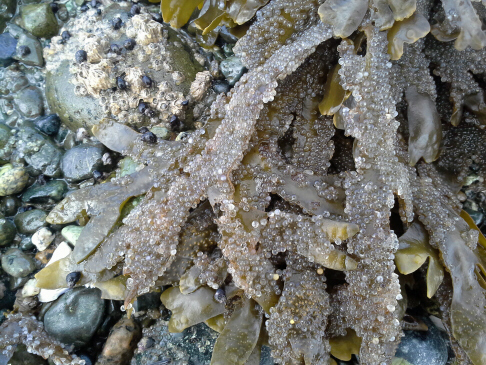 In my ignorance, I thought the spawn itself (where the females birth their eggs in the eelgrass and seaweed, and the males ejaculate their sperm all over to fertilize them) would last a good 10 days. Instead, I was told by some very kind scientists that the spawn, though momentous, actually is a very brief and unpredictable event that is pretty much over in a night. So I missed it by about 5 days. 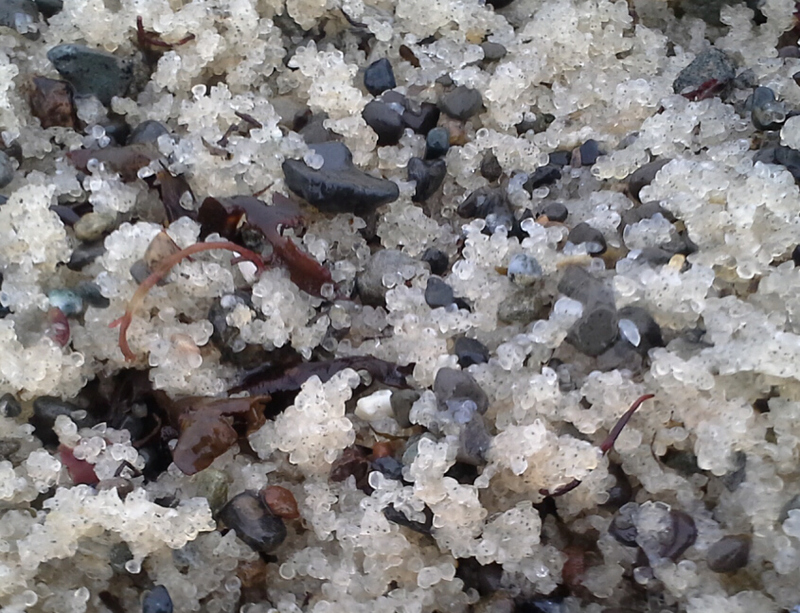 What I didn’t miss, though, was seeing the miracle of the herring roe—tiny, glassy balls clinging to seaweeds and rocks in the ocean and strewn along the beaches at low tide. 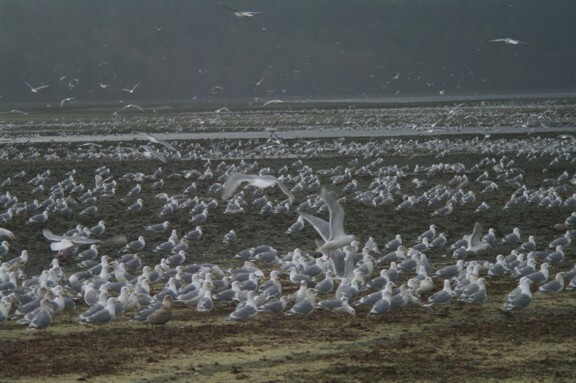 I also witnessed the thousands of gulls, brant geese, scoters and other seabirds who descend to feast on the roe. 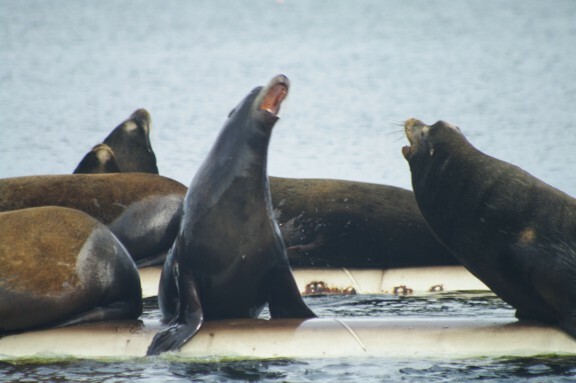 And the sea lions who journey south from Alaska and north from California to partake in the incredible buffet. All that was deep, and rich, and satisfying. 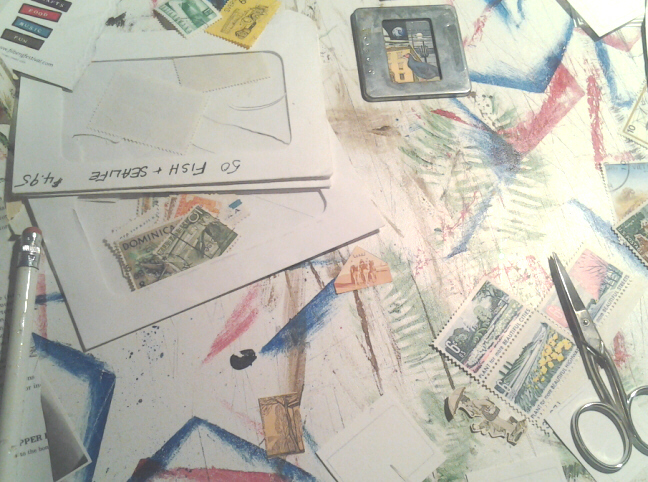 Now that I’m back in my studio, I’m working with all of this to create new work. Stay tuned! This past summer I was awarded one of a handful of commissions for original artwork by Vancity Credit Union. My piece, now hanging in the credit union’s newly renovated South Burnaby Branch, is a mixed media collage of Byrne Creek Ravine, a local park. If you’re in Burnaby, you can see the piece in the Branch’s Community Stage Room, a space that’s available for use by non-profit organizations. 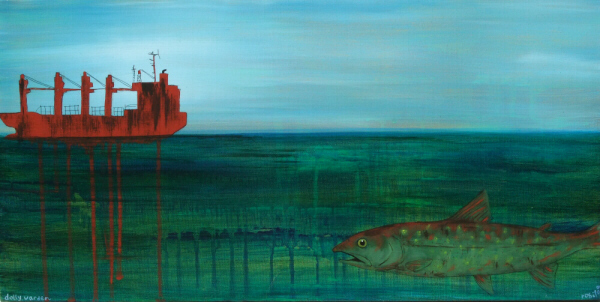 In developing the piece, I wanted to create the feeling of being in the ravine, surrounded by the fish, birds and animals that live there. I also wanted to incorporate the surrounding community and its relationship with nature. To begin with, I took a number of walks through the park and down the ravine to the water below. I took a series of photographs which became my reference points for developing the final piece. This one of me sketching was taken by a photographer at the Burnaby Now newspaper. 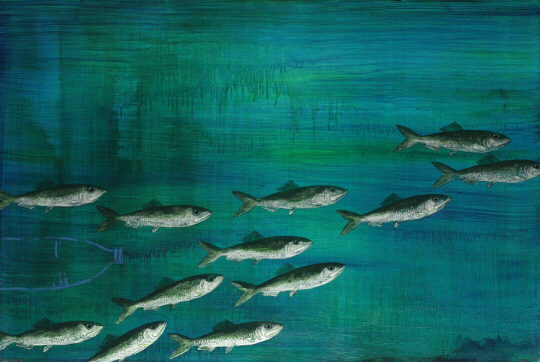 The artwork is a mixture of collage and acrylic painting on a wood panel. Back in my studio, I began sketching out the basic forms in acrylic paint, and then painting in the background. I then began adding collage elements. To bring the idea of the local community into the piece, I sourced some local history books and pamphlets about the original pioneers who settled in the area. I cut out the shapes of the forest (rocks, trees, logs, ferns, water) from the images and text from these papers, painted them with washes of acrylic and glued them on to the painted background. 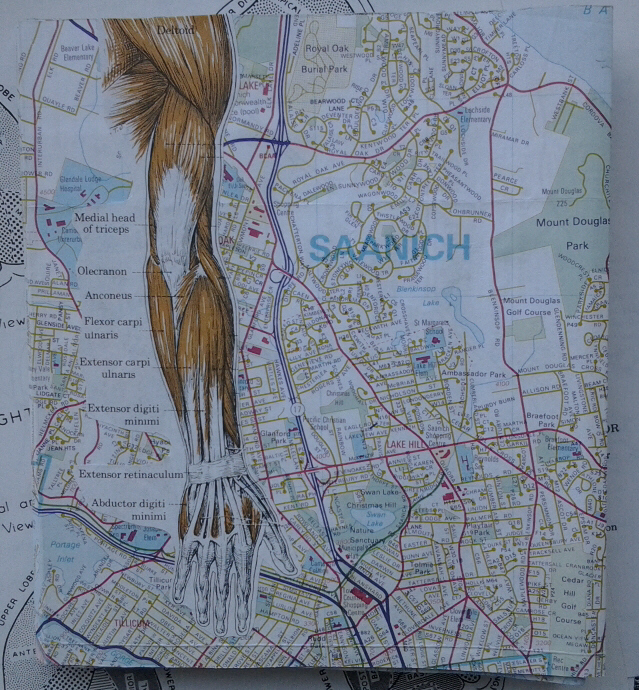 I then took maps of Burnaby and cut out in the shapes of animals. 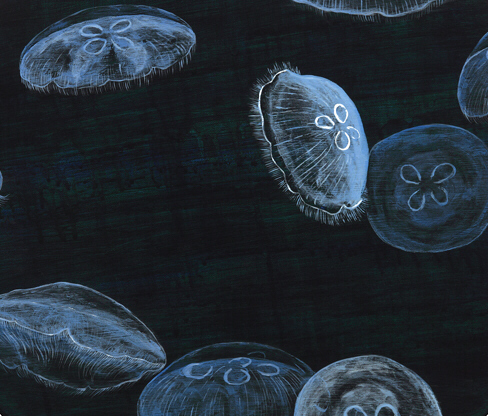 I painted them, drawing in details with ink, before adding them to the piece. 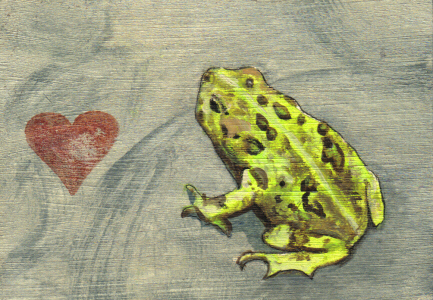 Because I wanted the animals and birds in the final piece to be true to the ones found in the park, I contacted the Byrne Creek Streamkeepers. They were very helpful, providing me with a list of species that volunteers have seen in the ravine. While I didn’t include every one, I did include a beaver, raccoons, skunk, coyote, squirrel, a robin, bald eagle, hawks, barred owl, salmon, trout and a lamprey. In the end, I’m very happy with the new piece. And it has a great home, hanging next to commissioned artwork by two of my favourite local artists, Rachael Ashe and Christina Norberg. About a decade ago, I was fortunate enough to take a master class with one of my heroes, artist and writer Nick Bantock. A brilliant artist, he is also tremendously skilled as a teacher and many of the ways he shared of how to approach creative work still inform my art making. One of the exercises Nick had us work through that week was to create a tiny, one inch by one inch collage entirely out of cut up postage stamps. My first attempt was messy and cluttered, but I fell in love with the scale and limited materials and have kept coming back to that concept over and over again. What I’ve discovered is that you can pack a whole lot of story into an inch or two, especially when the source material is so tiny. The pattern I’ve settled into is to find a stamp with a particular character, human or animal, that really speaks to me. I then look at other stamps to find elements that relate to that character. Together, a story is suggested, which I embellish in the title of each piece. Sometimes, the titles end up longer than the collage! For this one (above) I started with the woman, who in my mind was clearly in the pose of critically reviewing something. What fun to find the red bird and then a blue shell that the bird could be delivering. I imagined the castle in the background as the woman’s home. They’re standing on a piece of boreal forest. You can do that with collage. If you’re in BC’s Lower Mainland, you can see these and more of my postage stamp collages at a miniatures show which opens November 15 at Place des Arts in Coquitlam. The exhibition, Positively Petite, runs until December 21. This is the first time I think I’ve ever drawn one of my dreams even though my latest art journal encourages just this. 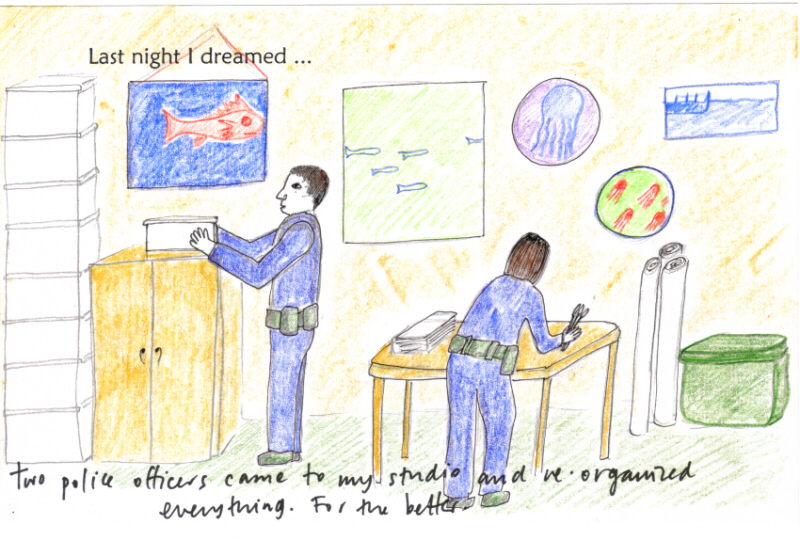 Funnily enough, it’s called “Last night I dreamed…”. Each page starts with this prompt (see above), and then invites you to write down or draw or paint or collage what you remember most about your nighttime meanderings. Maybe it’s just a colour or a sound, or a conversation, or maybe it’s a whole movie from start to finish (you could use more than one page). The book is currently at the printer (!) and will be available for sale ($10) as of this Sunday. I’m launching it at Word on the Street, where I’ll be exhibiting all my books and cards. Hope to see you there! I’m getting ready to exhibit at Word on the Street on September 30 and want to do something a little different this year. While I’ll have my Fish of British Columbia Colouring Book and The Things I See art journal on hand, I’d also like to create some books that are one-of-a-kind art pieces. 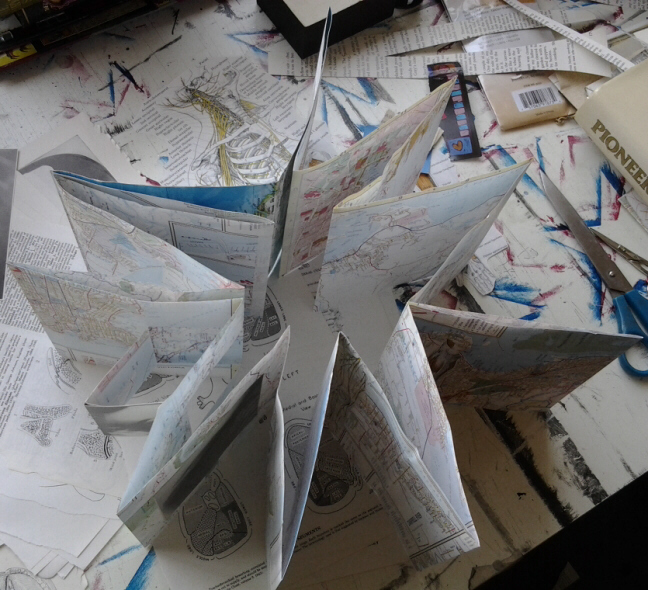 A few months ago, I decided to try making a simple accordion book that loops around into a star. Instead of using white paper and then having to come up with a story or images to fill it with, I decided I would create the whole book as a collage. 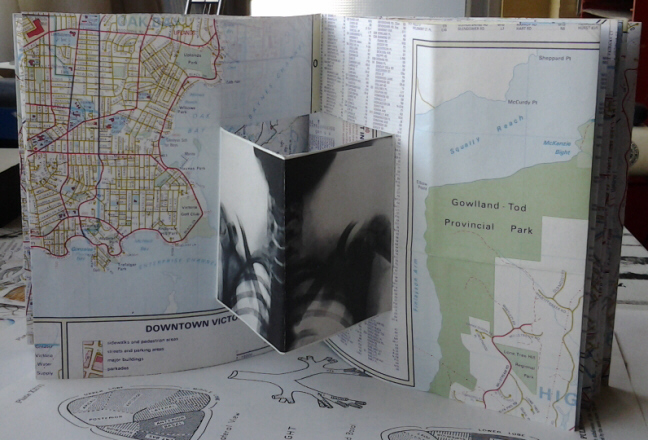 I cut a big map of Vancouver Island into strips and then folded and taped them into the accordion shape. Then life intervened and the book sat relatively untouched for weeks. 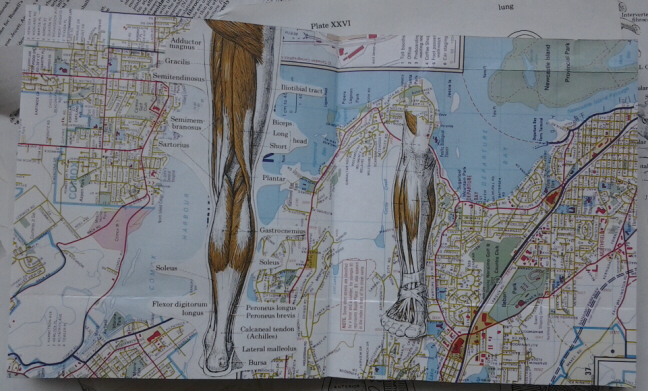 One big stumbling block has been what to collage on to the maps, especially since I like the maps the way they are. 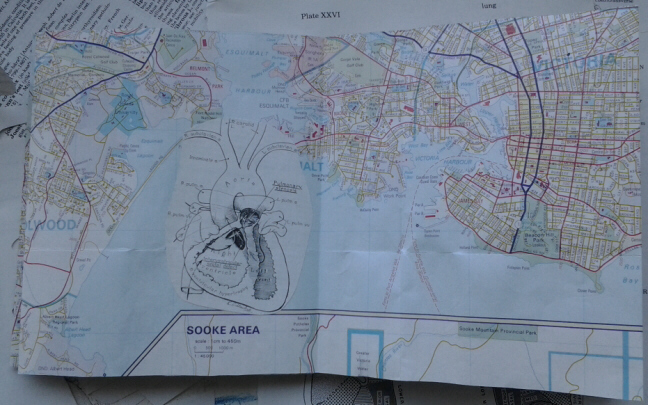 While I started thinking about collecting and incorporating items related to Vancouver Island, that seemed kind of predictable and boring. A few weeks ago, my friend and fellow artist Rachael Ashe hooked me up with a librarian she had met who works at a medical library. The library was culling out-of-date books and offered us the chance to look through and take home any of the books that were otherwise destined for the recycling. I came home to my studio with a big stack of inspiration. 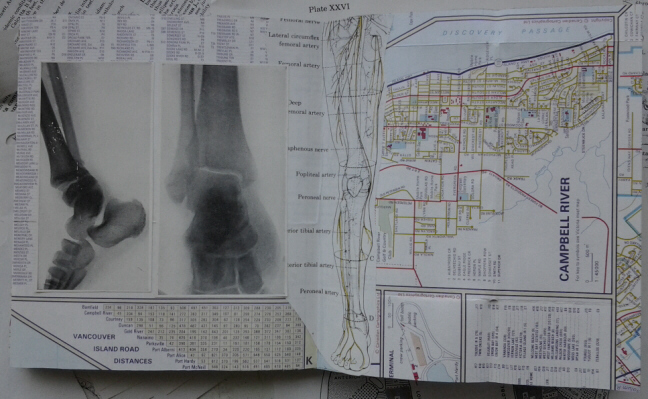 Looking through the medical illustrations and images, I began to notice how much the lines in the human body follow patterns that show up on the street maps. 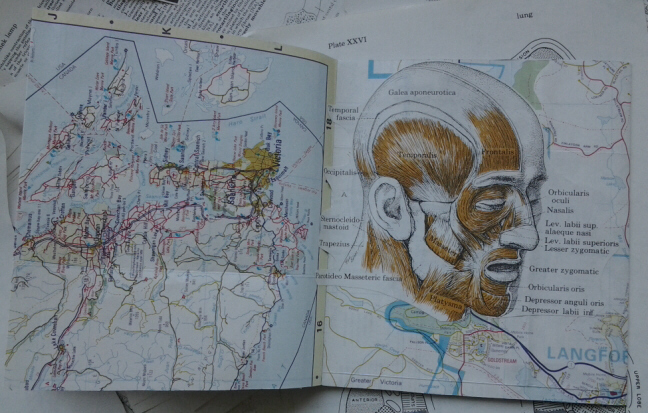 I started cutting them out and gluing them on to the maps. I’ve also been intrigued by x-ray images that are part of an old book about bone fractures. I’ve incorporated these in a couple of ways—gluing them into the maps and also creating a pop-up element into one spread of pages. I confess I don’t really know where I’m going with any of this, but I’m really enjoying the process and feel like I’m on the right track. I’ll post more images as they come together, and I’ll have the finished book with me at Word on the Street in a short couple of weeks. Yikes! 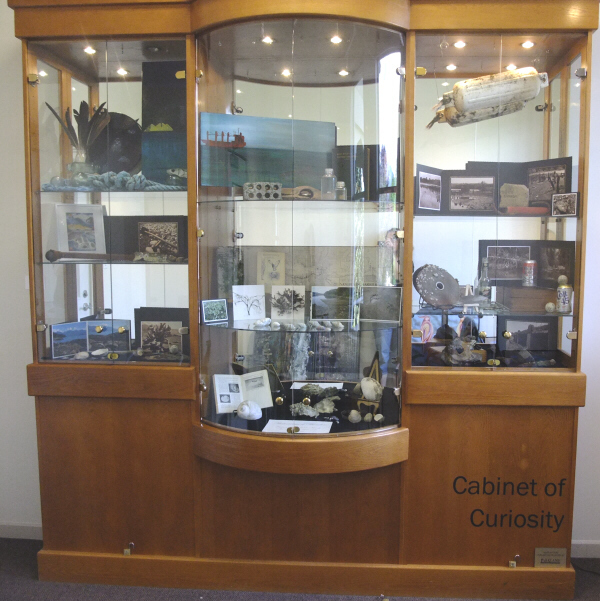 In curating the cabinet, I intended for the contents to flow from ocean to freshwater, from left to right, and then from the sea floor on the bottom shelf to land and then sky at the top. It didn’t work out 100% given the materials I ended up working with, but I stuck to the pattern as much as possible. 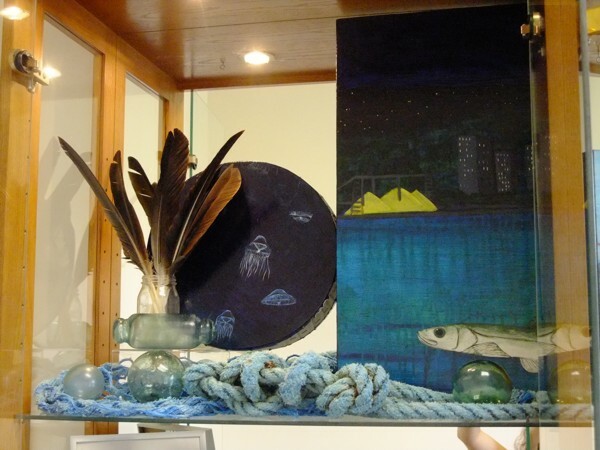 Here is the top left shelf, which shows a glass jar filled with raven’s feathers (sky), glass fishing floats (ocean’s surface), a rope found on a secluded rocky beach on Gambier Island, and a painting of mine of a capelin in Burrard Inlet. Throughout the cabinet are sepia-toned photographs I took of strange and large objects and places I encountered in the area. 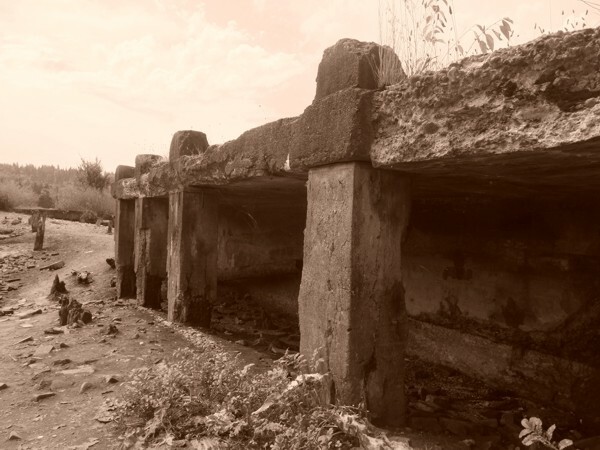 Adding these images gave me a way of including things I found that wouldn’t be possible to fit in the cabinet, such as a set of bear tracks, a decaying old wooden boat, and the ruins at the Old Mill site in Port Moody. 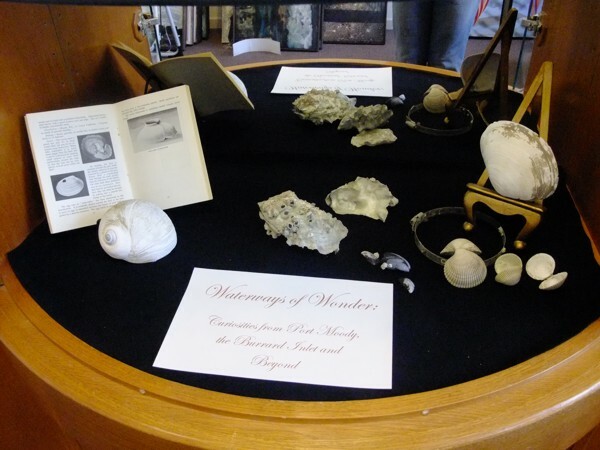 You can see more photographs in the Cabinet here. If you’re interested in seeing the Cabinet in person, here’s the Port Moody Arts Centre’s website for details about hours and location. I’d love your feedback!